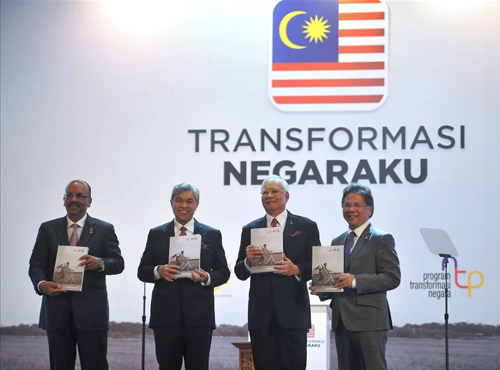 KUALA LUMPUR: The government has proven its critics wrong by achieving key milestone through the implementation of the National Transformation Programme (NTP), said Prime Minister Datuk Seri Najib Razak. He said the administration had made “brave decisions” to spur the nation’s growth and keep Malaysia on the right economic track. “This government, Barisan Nasional, has taken many bold actions, and many tough decisions, to achieve Malaysia’s goal of becoming a high-income (and) advanced economy,” he said when presenting the NTP Annual Report 2016 at Universiti Teknologi Mara (UiTM) here yesterday. Present were cabinet ministers, representatives from BN’s 14 component parties and corporate figures, as well as representatives from government linked companies and the private sector. Representatives from non-governmental organisations, undergraduates and youths were also among the 5,000-strong crowd. 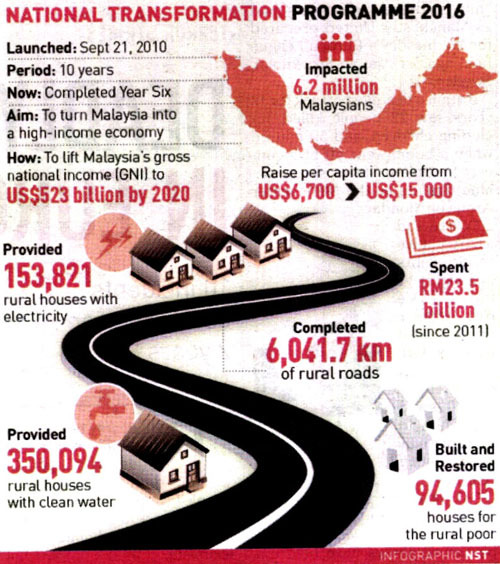 Najib has presented the National Transformation Programme annual report six time since its implementation in 2010. Describing Malaysians at the “stakeholders of the nation”, he said the people’s wellbeing was the government’s priority. Najib made it clear that no other government in the world was as “transparent” or had the “discipline of action” to fulfil its promises to the people. Since the implementation of the NTP, Najib said, the country recorded a gross domestic product (GDP) growth of 5.1 per cent a year, which was twice the global average. He said poverty had declined from 3.8 per cent in 2009 to just 0.6 per cent in 2014, while hard-core poverty was almost completely eradicated. He said 3.3 million jobs would be created by 2020, adding that 2.26 million jobs had been generated. He said NTP had not only increased the people’s income and spending power, but also prevented the country from falling into the middle-income trap. Najib said the country’s fiscal deficit had been reduced from 6.7 per cent in 2009 to 3.1 per cent last year. On the government’s plan to develop a world-class public transport system, Najib said the Light Rail Transit Extension and Mass Rapid Transit projects would deliver “big and fast results” to people in the Klang Valley. He described the upcoming East Coast Rail Link, High Speed Rail and Pan-Borneo Highway projects as game-changers that would provide economic opportunities for the people.